One of the masterworks of 1960s cinema, La notte [The Night] marked yet another development in the continuous stylistic evolution of its director, Michelangelo Antonioni – even as it solidified his reputation as one of the greatest artists of the 20th century. La notte is Antonioni’s "Twilight of the Gods", but composed in cinematic terms. Examined from a crane-shot, it’s a sprawling study of Italy’s upper middle-class; seen in close-up, it’s an x-ray of modern man’s psychic desolation. Two of the giants of film-acting come together as a married couple living in crisis: Marcello Mastroianni (La dolce vita, 8-1/2) and Jeanne Moreau (Jules et Jim, Bay of Angels). He is a renowned author and "public intellectual"; she is "the wife". Over the course of one day and the night into which it inevitably bleeds, the pair will come to re-examine their emotional bonds, and grapple with the question of whether love and communication are even possible in a world built out of profligate idylls and sexual hysteria. Photographed in rapturous black-and-white by the great Gianni di Venanzo (8-1/2, Giulietta degli spiriti), La notte presents the beauty of seduction, then asks: "When did this occur – this seduction of Beauty?" 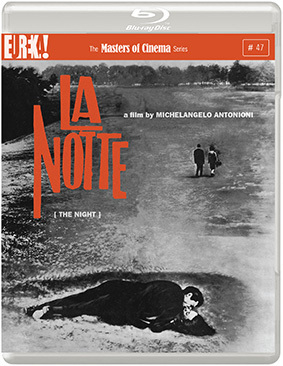 La Notte will be released on Blu-ray for the first time ever anywhere in the world on 22nd April 2013 by Eureka as part of the Masters of Cinema series at the RRP of £20.42.